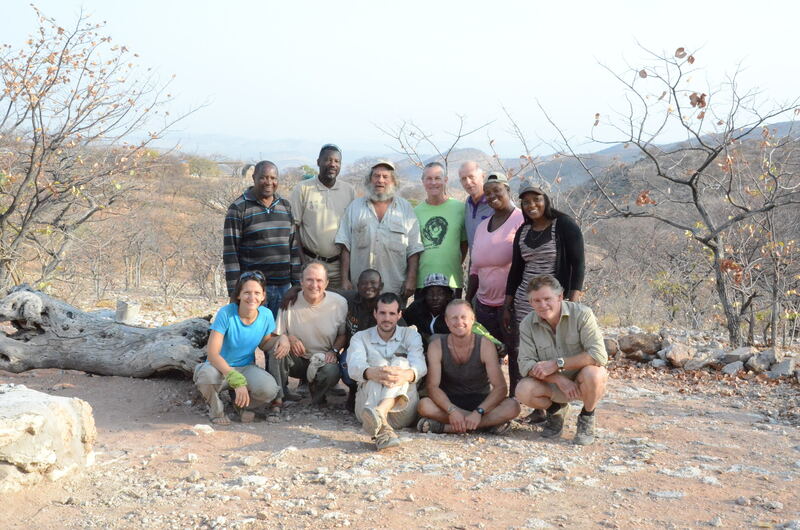 A team of 5 UK and 2 French speleologists visited Kaokoland in Kunene Province Northern Namibia for an 18 day expedition during September 2015. Planning for the expedition through the earlier part of 2015 comprised literature research, correspondence with earlier cave explorers and study of geological maps and publications. The expedition received an invitation and in-country support from IRDNC – Integrated Rural Development and Nature Conservation, an NGO who wanted any caves evaluated for potential tourism resource and conservation. The expedition used 2 camp locations, one at Opuwo and one at Camp Aussicht. These locations were used to access cave objectives identified either from Google Earth or from local information. 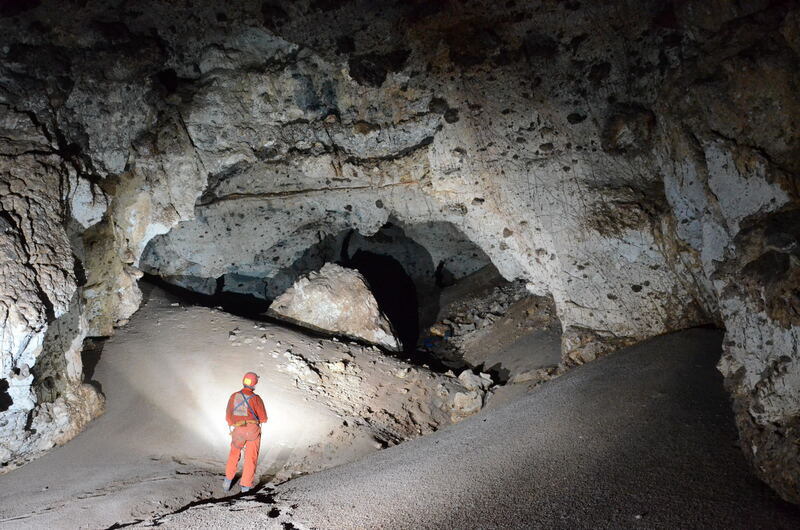 Many cave objectives were found to be too short to be of interest (<10 m) or blind dolines, however 7 new caves of moderate length were found and evaluated. The longest and most impressive of these was Ondimba ja Omungongo (Cave of Omungongo) which was found to be 358 m surveyed length and 59 m deep. Two further new caves found were each around 100 m long and the remaining 4 caves were each around 30 m surveyed length. The caves are formed in Neoproterozoic (PreCambrian) dolomite and limestone of the Otavi Group and located on faults or other fractures. The caves are likely to be of hypogenic origin with no obvious relation to present day surface drainage or topography. The caves explored contain morphologies consistent with this mode of origin. 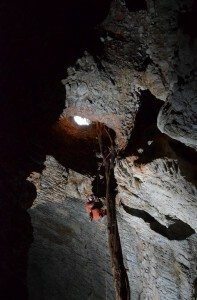 Many of the caves start with vertical pitches between 10 m and 25 m deep, followed by inclined passages and chambers leading down to sediment chokes. The caves explored contain significant bat populations and the original expedition objective of recording species present had to be deferred until a future year after sufficient permits for collection are obtained. Ondimba ja Omungongo in particular had a large bat population with metres deep banks of dried bat guano in many parts. Other fauna of interest included 5 small mummified antelope found in Ondimba ja Mundumitha, probably Steenbok, which had become trapped after jumping or falling into the 3m deep entrance pitch. In another cave Ondimba ja Okavau the expedition found the skeleton of an Oryx which had been the subject of local folklore from several decades ago when a local hunter was said to have chased it with his dogs and in trying to escape the unfortunate animal had jumped into the 25 m deep entrance shaft and been lost, the hunter returning empty handed. This cave also has an unusual tree root system down the entire entrance shaft. All the new caves explored and numerous other sites had entrance locations shown to the expedition by local villagers. The entrances are mostly quite small and require local knowledge to find. The team was also directed to a few previously explored sites recorded in the 1990’s by Namibian and South African cavers but only 2 of these were explored, the massive Orumana Sinkhole which contains 2 large chambers one of which is cathedral sized and Blister Pot which is less interesting. Because IRDNC and local villagers were previously unaware exactly what type of features the expedition team was keen to explore, extra time was required and fewer entrance locations visited than if this was not the case. Therefore in subsequent years any further expedition is likely to be able to make quicker progress with prior identification of cave sites in advance of expedition arrival in the field. It can be expected that many more hypogenic caves of similar character will be found in this region where Otavi Group dolomite and limestone formations occur.